Central Michigan isn't known for its up-and-down golf courses, but that's what Timber Ridge Golf Club provides. 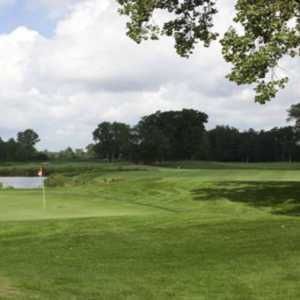 Minutes from Michigan State's campus, Timber Ridge is a pleasant surprise, complete with great golf and friendly staff. Timber Ridge Golf Club's 10th hole rolls out below you. Timber Ridge Golf Course was carefully carved from a mature tree nursery that was planted in the 1940s. As a result, the course enjoys more than 60 varieties of trees throughout. The designer, Jerry Matthews, wanted to not only preserve the trees but also work with the existing hills and wetlands so that the course blended seamlessly into the natural environment. EAST LANSING, Mich. - Standing on the tee, looking 80 feet down at a rolling fairway, only seeing trees and a green tucked back up another hill in the shadows, you suddenly want to check one of those GPS systems. No, not to see how far you have to hit the ball to get above the dip in the fairway. Rather, to make sure that you're still anywhere near Lansing's capital region. Tom Tom, where oh where did you bring me? The 10th hole at Timber Ridge Golf Club brings about the kind of elevation change you expect to see in a Las Vegas or a Tucson. At the very least, it looks like it belongs among Northern Michigan's towering, tree-top, up-and-down courses. This is central Michigan, though, minutes away from Michigan State's bustling 40,000-plus student campus, an area where everything is flat (except for the co-eds who got some enhancement surgery as a high school graduation gift). Except at Timber Ridge. This Jerry Matthews design brings the hills into Lansing area golf. No. 14 is another hole with a towering view from a big ridge tee. All you see are trees stretching out below you. All your hear are birds chirping away. If this is golf gone to the birds, you're more than fine with that. "It's like you've been dropped off in the middle of nowhere," local Tom Jacobson, a first-time Timber Ridge player, said. "I had no idea there even was scenery like this so close to my home." Yes, Timber Ridge can be a welcome jolt for even people who've lived in this area for years. Even better, it is one of the least pretentious - and most inexpensive - good golf courses you'll ever play. Timber Ridge's greens fee maxes out at $56 with cart (you can play for $46 walking) during summer-high season. Its summer twilight rate is only $37. And this is one course with a staff that goes out of its way to treat its twilight customers with respect, rather than the second-class, second-citizen approach too many courses take in dealing with golfers seeking a discount. On the day of this play, golfers were still putting out at 9:15 p.m., not being rushed at all by Timber Ridge's staff, even as Michigan's late summer sun all but completely faded. Timber Ridge is the type of golf course that actually grows the game. It's hard to leave here not feeling good about golf - even if you're not feeling so good about the shots you hit into the trees. There aren't a ton of forced carries, but when Matthews does introduce water, it's a real danger. Take No. 16; this downhill par 3 puts water in front of a big, sloped, sideways green that actually tilts toward the wet stuff. Short and on can still mean in the pond as you helplessly watch your ball roll down from back on the tee box. Timber Ridge can be as unconventional as a pair of Ian Poulter's pants. There are short par 4s that give you a real chance at birdie (like the 310-yard 12th). There are plenty of climbs uphill - starting with No. 3, a hole that swerves around a lake and puts you right below a hulking house that lords over the green. This course doesn't beat you up with distance (it's 6,595 yards from the back tees, and no par 5 measures longer than 545 yards). Timber Ridge doesn't try to beat you up, period. Its 144 slope rating is somewhat deceiving. This is a fun course and anything but root canal golf. If you're in Lansing for business, or East Lansing to see a Michigan State football or basketball game, you'll want to make time to play Timber Ridge. It's much better than its neighbor that's almost equally highly rated in many golf magazines, Eagle Eye Golf Club. You're not completely lost in the woods by any stretch at Timber Ridge. There are a few houses around parts of the course. But it often feels like you're deep in the woods. Cart rides in-between holes can take you through stretches where the trees are so thick they almost block out the sun. About the only annoying thing about Timber Ridge is a GPS system on the carts that often acts like an overbearing mother. You'll get messages about following the 90 degree - even if you've been following the 90 degree rule. You'll get way-off reports on your playing pace even when there is no group close to you. It could have been a temporary cart glitch. Either way, it's not going to temper your enjoyment of Timber Ridge. Not when the actual humans in the clubhouse are so nice, and the golf's so fine. You pass right by exclusive private course Walnut Hills Country Club - the former site of an LPGA Tour event - on the road to Timber Ridge. But there's no need to envy the golfers on those fairways. Not when you're getting to play as high as it gets in central Michigan golf. There's a Marriott right in the heart of East Lansing that puts you smack dab in the middle of the student nightlife scene (yes, most golfers hate to see tipsy coeds), while still giving you a business hotel retreat with a pretty good hotel restaurant in Bistro 43.
let's be fair. Eagle Eye is in a league of it's own (a top-notch course), but Timber Ridge is clearly the best golf VALUE in Mid-Michigan with rates that save you over $50 a round over Eagle Eye. Over the past 10 years, I've played Hawk Hollow (another great nearby course) and Timber Ridge about 25 times each and consider them near equals. Chris you are an idiot, you clearly are no good at golf and have no idea what you are talking about. No idiot would tell you that this course is better than eagle eye. It is probably not even the 2nd best course in the area. Much better than Eagle Eye? Eagle Eye was rated #47 Public golf course IN THE NATION by Golf Digest (May 2009.) Timber Ridge has nowhere near that rating...even in Michigan only golf course reviews.